MobileReporter makes its first move to implement one of the key projects of its Arctic Rounder initiative: taking 360° photos of Northern polar territories and connect them into immersive panoramic tours. Every Google Maps user can then walk along these virtual trails to feel closer to the World most remote and fragile regions, rarely visited and poorly known by most people. Stefano Valentino, MobileReporter Founder and Google Trusted Photographer, reached the Siberian tundra near the city of Yar Sale in the Yamal peninsula, where he spent some time with a Nenet indigenous family that hosted him in their chum (traditional nomad tent). Their youngest son, Timur, decided to accompany Stefano for a while across the deep snow surrounding his home. Together, they embarked on an atmospheric sunset photo-shooting tour in the endless white landscape. 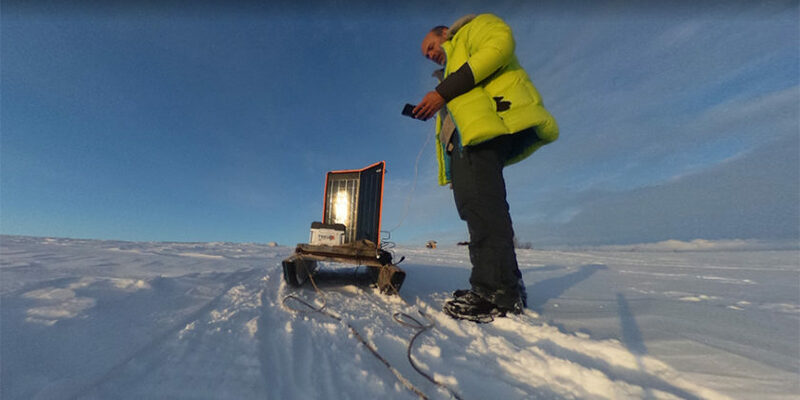 To prevent extreme low temperatures to shut down his smartphone and disconnect his app-controlled Street View camera after a few shots, Stefano, constantly charged his device with an accumulator powered by a solar panel. During the excursion, Timur generously offered Stefano to install the solar panel and all the other equipment on the wooden sled usually used by his family to carry firewood for their stove. This was a successful combination of old and modern technology, as you can see by yourself in our video. Carbon-free pictures represent a powerful tool, as well as a symbolic environment-friendly contribution, to rise public awareness about the pristine habitats of the Arctic where both ecosystems and local communities are endangered by climate change.